Ruvin Bun(as), the son of Abraham and Chaya Dina Bun(as), was born on May 11, 1902, in the hamlet of Pasubatė, in the Rokiškis region, Zarasių Uyezd, and later lived in nearby Aleksandravėlė, which is about 8 kilometers southeast of Obeliai / Abel. 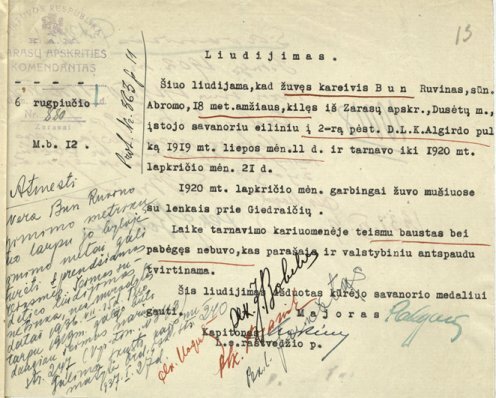 On July 11, 1919, during Lithuania’s Wars of Independence, Ruvin volunteered to serve in the Lithuanian army. He died in battle near Giedraičiai on November 21, 1920, the last day of the Lithuanian-Polish War. Volunteer Private Ruvin Bun was buried in the Ukmergė Jewish cemetery. 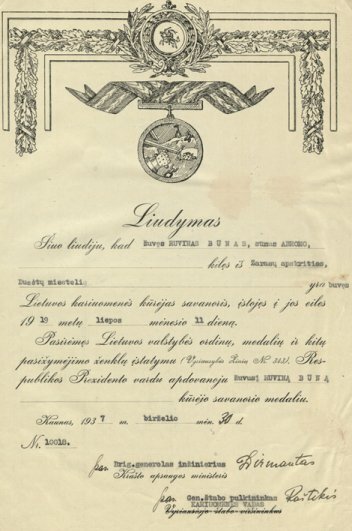 In 1937, Private Bun posthumously received Lithuania’s Volunteer Service Medal. The following three pages constitute the certificate of his service. Lithuanian Central State Archives, Liudymo Nr. 10018 (F. 930, ap. 4, b. 694, 1.12, 13a. p., 22). 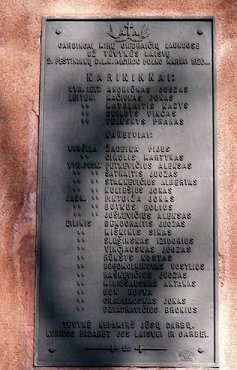 This certifies that the killed soldier Ruvin Bun, the son of Abram, 18 years of age, from the town of Dusetos, Zarasai County, was a volunteer private in the Second Battalion of the Grand Duke of Lithuania Algirdas Infantry Regiment from July 11, 1919, until November 21, 1920. In November 1920 he perished honorably in combat against Polish forces at Giedraičiai. During the period of his military service he was never charged with a violation or desertion. This is certified by these signatures and the state seal. This certificate is issued to prove that a medal should be granted. The diagonal signature on this page is that of Colonel J. Bobelis. His signature also appears on the following page.